CST is honored for the opportunity to work with Clint Swigert of Shooting For Perfection in the development of the SFP Pro-X Barrel Tuner. Following Clint's instructions closely has yielded the first barrel tuning device that allows a tuning procedure of both mathematical volume as well as allowing the addition of mass (weight). These two tuning methodologies can be used independently or in conjunction with each other, allowing more options finding accuracy solutions. Regardless of which method prescribed to, we believe the Pro-X Tuner to be the best barrel tuner available for rimfire shooters wishing to find that "last crumb on the table" for the ultimate in accuracy. First introduced by SFP in 2015, CST is delighted to offer the Pro-X Tuner and accessories here, a truly innovative product for the most discriminating shooter. * Precision collet-type fastening to the barrel using two #6 socket head screws, (.700" ID is standard). * Polished aerospace grade 6061-T6 aluminum material for Tuner and Bushings. Fit and finish not to be duplicated! Once the Pro-X Tuner is installed to the end of the barrel, the front housing can be linearly adjusted to find a "sweet spot" yielding optimal accuracy. To facilitate this process, additional weight can be added or different length bushings can be added to the front of the tuner, both methods altering the barrel harmonics with final tweaks completed by adjusting the front housing. Just as a micrometer, the front housing is graduated .001" increments, .025" per revolution, .400" total adjustment range. The Pro-X Tuner unmodified and without attachments weighs in at 5.3 ounces. 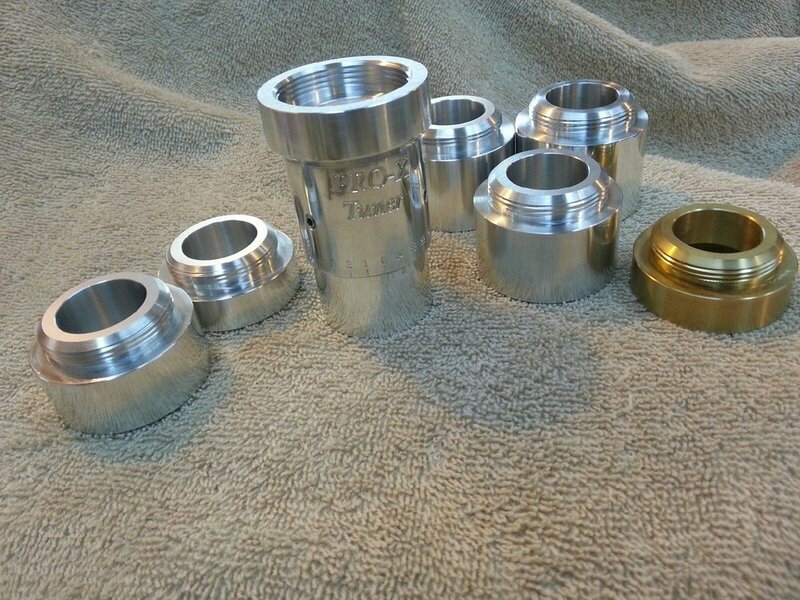 The Brass Thread Adapter adds 3.65 ounces for a total of 8.95 ounces. With the Thread Adapter installed, additional weights can be added using the forward 1-3/8 - 32 tpi thread of the Thread Adapter. Using the 9th harmonic with the Pro-X Tuner and a little math, an anticipated adjustment configuration and setting can be acquired quickly with surprisingly positive results. The 9th harmonic dictates that the barrel length be measured first, from the bolt face to the edge of the crown, (not the end of the barrel). Once this value is known, simply find which combination of Tuner and Bushing (see Tuner Configurations below) puts your barrel in the middle of the available range. To find the final setting, use the provided starting barrel length (tuner is at "0" setting), and for every .008" your barrel extends past this starting point value, move the front housing out .001". To simplify, the amount of extra length your barrel is over the starting points provided below, this amount is divided by 8 to find the micrometer setting on the front housing. EXAMPLE: Your barrel measures 20.68". You pick the Tuner + 1/2" Bushing Configuration, with a barrel length range of 18.424" to 21.624". Your barrel is 2.256" longer than the starting point (20.68 minus 18.424). You divide 2.256" by 8, equaling .282". Using the micrometer, you now move the front housing forward to a value of .282" and go shoot! Tuner - no attachments = Barrel lengths starting at 15.37" to 18.57"
Tuner + 1/2" Bushing = Barrel lengths starting at 18.424" to 21.624"
Tuner + 3/4" Bushing = Barrel lengths starting at 20.424" to 23.624"
Tuner + 1" Bushing = Barrel lengths starting at 22.424" to 25.624"
Tuner + 1-1/8" Bushing = Barrel lengths starting at 23.424" to 26.624"
Tuner + 1-1/4" Bushing = Barrel lengths starting at 24.424" to 27.624"
Tuner + Brass Thread Adapter = Barrel lengths starting at 19.16" to 22.36"
NOTE: The SFP Pro-X Barrel Tuner comes with a .700" Bore for attachment to the end of the barrel. When enlarging this bore to fit the barrel to be used, it is important to maintain the bore depth (1.200") presented with the tuner for accuracy of the above values. 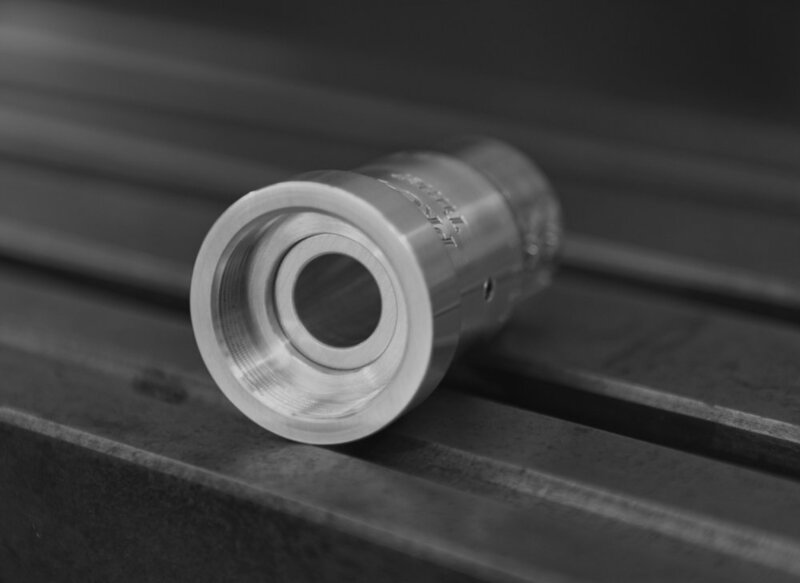 It is advised that machining to the tuner should be done by a qualified gunsmith currently doing work successfully for rimfire benchrest shooters.